Tufte Wear's goal is to make as comfortable clothing as possible, produced with the most environmentally friendly processes available. Tufte Wear was founded by Olaf Tufte. A genuine guy, farmer and Olympic champion from Vestfold. Pivot was asked by Tufte Wear to produce a tool free and easy to assemble modular point of sale system for their products. We started of by sketching in 3D deifferent soloutions for a modular system and overall aesthtic direction. The chosen concpt was detailed technically in 3D, visualised and protoypes produced. After a few rounds of refinements the technical drawings for both manufacture and assembly were produced. 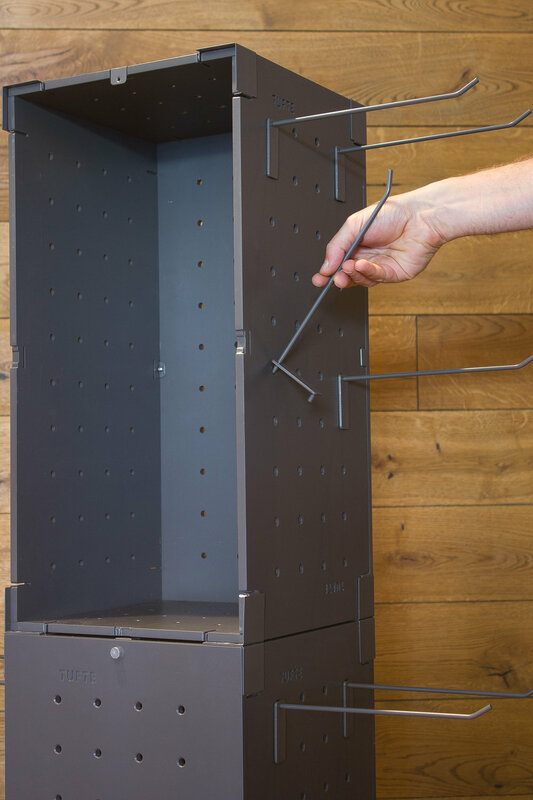 The system is flatpack and has a skill level that casual worker can assemble. The system has easy to access and spacious internal storage for stores that have limited storage. The insides also do not damage the products packaging. The boxes are stackable horizontally and vertically. The hole grid accepts a range of tool free attachments to display both products and marketing materials such as posters/mirrors. Untli now, there has been produced over 500 units. They are currently in all Enklere Liv shops.